Nigerian Woman Spots Her Daughter In Boko Haram Video : The Two-Way The video released by extremist group Boko Haram on Monday shows more than 100 abducted girls. Officials say they are open to negotiate. 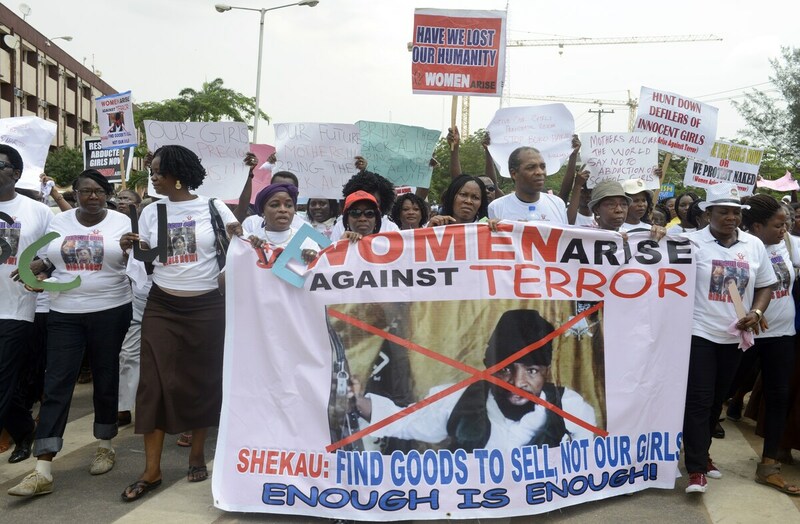 Demonstrators call for the release of girls kidnapped from a school in Nigeria, during a demonstration in Lagos on Monday. A woman has said her daughter is in a video released by Boko Haram, the group that took the girls last month. The video released by extremist group Boko Haram on Monday, showing more than 100 girls abducted from their school in Nigeria last month, included a girl whose mother has identified her, says a representative of the parents of the kidnapped girls. Parent-teacher association chairman Dumoma Mpur tells Reuters, "The video got parents apprehensive again after watching it but the various steps taken by the governments and the coming of the foreign troops is boosting our spirit, even though I have not seen the any one soldier in Chibok yet." Chibok is the northeastern Nigerian town where more than 200 girls were taken from the Government Girls Secondary School by gunmen. The girls' fate has been a cause of concern ever since; the first hint that the militants might be holding them in the same place came in the video released Monday. It shows the girls in an outdoor area, wearing full-length hijabs. The statement from one of the students' mothers would seem to confirm the video is genuine, although there's no way to know if it was filmed recently, or shortly after the mass kidnapping. The U.S. is working to help Nigeria find the abducted girls, in an effort that includes "flying manned surveillance missions over Nigeria," the BBC reports. The AP says the U.S. team includes "nearly 30 people drawn from the State and Defense departments, as well as the FBI, including 10 Defense Department planners who were already in Nigeria and were redirected to assist the government." In the video released Monday, Boko Haram leader Abubakar Shekau doesn't appear in any images with the girls. But he says he's willing to trade the girls in exchange for the release of imprisoned militants. Nigerian officials had said the government wouldn't negotiate with the terrorist group, which has waged a bloody campaign against Western influence for the past five years. But Mike Omri, the director of Nigeria's National Orientation Agency, said Monday that "all options are open," according to the AP. In addition to the U.S., teams from Britain, France and China are now in Nigeria to help find the abducted girls.